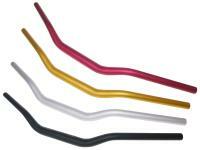 Tapered motorcycle handlebars from 6061 T6 aluminium with 28.6mm diameter. The handlebars are anodised, 725mm wide and have a tube diameter of 22mm (dash) or 28.6 mm (clamping). Please select your required colour from the list below.